Having the right metal detecting digging tools is of the utmost importance. Believe me, I have been out in the field and a metal detecting shovel has broke, I’ve gone home with terrible back pains from using the wrong spade and generally not had the right tools to do the job. When I first began metal detecting I was that excited to get out I couldn’t wait to purchase a shovel. So I went armed with a knife and a trowel. It’s safe to say that both broke within the first hour and I had to head home. I have created this article reviewing and discussing what are the best metal detecting digging tools in the hope that it helps you increase your find rate, to save you some backache and to make your metal detecting experience a little easier. There are many different metal detecting digging tools available, and each has their own fans. Each to their own and everyone is different, having different requirements and different budgets. Some take just a small metal detecting shovel, some a shovel and trowel, some have stainless steel top of the line super spades and some have had their trusty spade for years. What are the best Metal Detecting Shovels or Spades? What I will do to answer this question is give you some options. Ensuring that there is something for you all, and meeting all budget requirements. With hundreds of detectorists recommending the Roughneck Micro Round Shovel it’s safe to say that it’s a fantastic small budget metal detecting shovel, perfect if you are a beginner detectorist who wants to get out straight away. When I say specifically the Roughneck that is because I use this myself and have seen many others with the same. There are other very similar options all for around the same price. Try to stick with a good brand name like Roughneck, Draper or Silverline when choosing your micro shovel. The Roughneck shovel has lasted me a good few years now. You’ll dig a very accurate hole with this mini spade and have great control with it, keeping your plug very tidy. Pro’s: Long lasting, Durable, Compact, cheap. Con’s: Not so great for the taller detectorists. I personally have never got on well with the Folding Shovels and they have always played hell with my back, so I imagine for someone taller it would be worse. Fully unfolded it’s a very small 480mm in length. That being said it is a metal detecting digging shovel that is often recommended or sought after. IF you have to have one then there is only one that I will recommend. The Fobachi Folding military shovel. It’s very small and fits into its own carry case, it has a serrated edge on one side to help cut through roots and turf. It’s made of tempered forged steel and the body is of a high carbon steel. It can be used as a pick or a shovel. If you’re thirsty, it has a built-in bottle opener. As you will see from the reviews on Amazon it’s probably one of, if not the best military trenching tool available in the UK. I imagine the appeal of a folding military shovel is its size and portability. They do work and I have used them previously I just found that it caused my back troubles. Pro’s: Durable, strong, compact, highly portable, low price. Con’s: Very small can cause back pain. The “Big Daddy” of Metal Detecting Shovels & Spades. 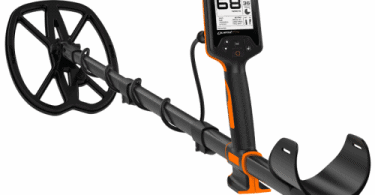 The Evolution Pro Cut spade is designed specifically with metal detecting in mind. This shovel copes with all rough terrains, rocks, and tough ground. Designed and built in the UK, the Evolution Pro Cut spade does not scrimp when it comes to the build. It’s made from strengthened stainless steel and so are the welds. It has a toothed serrated blade on both sides for added effectiveness when cutting through the sod. On top of the blade, there is a footrest for assisted digging and a very comfortable handle. I have to say that if you do have a larger budget and you can justify spending the money, the Evolution Pro Cut spade will make your life very easy. No more crouching down or hard graft. Cut your plug without breaking a sweat as the blade just slides straight through most grounds. It’s perfect because of the length to dig the “trapdoor” plug, simply cut 3 sides and tilt the spade backward to flap the plug out. Money well spent if you take the hobby seriously. Highly recommended. 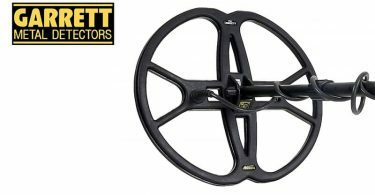 Pros: Very well built should last a lifetime, perfect for taller detectorists, makes light work of all ground conditions. What are the best Metal Detecting Trowels or Knives? Firstly I just want to say that I would not recommend carrying a knife with you in this day and age. It used to be something most detectorists would have with them. Knives were used to cut through roots etc but the police wouldn’t take too kindly it these days. So you’re probably safer avoiding carrying a concealed weapon! Most good metal detecting trowels these days now have a serrated blade edge to assist you instead which work just as well as knives in many situations. It’s hard to find a “cheap” detecting trowel with quality. A normal garden trowel is not going to “cut it” so you’re going to have to be prepared to pay a little more. Remember buy cheap buy twice. That being said Garrett have a trowel that is cheaper than most metal detecting trowels. The Garrett Edge Digger comes with a handy sheath so you can attach it to you and is constructed of heavy-duty steel. It comes very highly recommended with many proclaiming it made their digging experience much easier. It has two serrated edges and a comfortable handle with added grip. A detecting trowel like this will allow you to keep your holes very small and very neat. It also helps when you’ve dug the plug to locate the target if it’s still in the hole, without damaging the object with a shovel. These make for very handy metal detecting digging tools! Pros: Portable, Tough, Neat plugs. Cons: Reports of a flimsy sheath, still fairly expensive. I’ve considered purchasing the Lesche Digging tool quite often after many of my detectorist friends have preached about it so much. I just can’t bring myself to justify the high price. However, that doesn’t mean it’s not worth every penny to the right person. Many believe it will last a lifetime. With over 400 5 star reviews on Amazon alone, it’s clear that it is probably the best metal detecting trowel on the market. It’s just as popular with gardeners. Made from USA aircraft-quality steel which has been further strengthened with heat-treatment and comes with a lifetime guarantee! You’re guaranteed a neat hole on turf and sod and it will cut through like it was made from butter. Some of my friends have said that it also cuts through thick roots and weed with ease. There is a serrated edge to assist with digging and it comes with its very own handy sheath so you can attach it to your belt and carry it with you at all times. Rocks? No problem you can pry them out and not worry about the Lesche Digging tool snapping or bending. It’s relatively lightweight considering the strength and is approximately 13 inches in length. It has a comfy red handle with ridging for extra grip. I feel this is the perfect tool for those who want to keep a neat hole, for those who like to dig in woodland and for those who have that little extra to spend on their hobby. It’s definitely going to make your digging experience much easier. Pros: Lifetime Guarantee, Amazing strength, Unbreakable, Portable with the handy sheath. It has to be said that there is no easy way of choosing a favourite or one single metal detecting digging tool that is best for the job or superior to the rest. This is because all ground is different and we as detectorists all have our own preferences and needs. You will need to work out your needs and what you want to achieve. You will also need to work out just how much you are prepared or can afford to spend on your hobby. I think it’s a good idea to have both a shovel and a trowel with you at all times when metal detecting. This way you will always have the right tool for the job and you won’t miss out on anything. I hope that I have shed some light on what metal detecting digging tools are available and what comes most recommended. Please if you have any more digging tool recommendations leave them in the comments below to help your fellow detectorists.